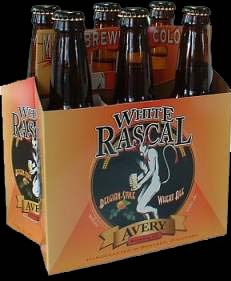 The White Rascal pours a cloudy light yellow color, settling into a medium hazy yellow body. The body also contained many floating yeast particles. The medium fizzy white head was fully diminishing and had sticky lacing. The nose detected a strong yeast presence with hints of lemon and banana. This is a very inviting beer and is making my palate moist. The initial acidic taste was quickly followed by a faint sweet taste for an average duration. Soft carbonation, light to medium in body along with a light creamy texture, this isn't like a typical Wheat ale. The citrus taste wasn't as strong as I expected from the citrus aromatic presence. It's not as strong in flavor as the Harpoon UFO, but it's mild taste is appealing to the palate.